With Autumn quickly approaching and the crisp cold air starting to fall nothing has me more excited for this time of year. I bloomin adore Autumn, everything about it makes me super happy and I'm so glad it's that time again! So while I love everything about it I thought I'd share some of my must have autumnal fashion and beauty items. So without a doubt the first thing I have to mention is Berry Lips. I live for berry lipsticks and absolutely love wearing them. I'd definitely say a good 80% of my lip products are berry shades, and to be honest I mostly wear them all year round. However when Autumn comes it's basically all I wear. This year I have picked out three favourites that I just know I'm going to wear so much. Starting with the Mac Viva Glam Ariana Grande I. This looks black while in the packaging but when you apply it, it is the most gorgeous dark plum shade ever. Another shade is the Mac Hearts aFlame which is more on the red toned berry shade but still absolutely beautiful. Theres nothing I love more than a good dark red lipstick. Finally I'm so bloomin excited to start wearing my Leo liquid lipstick by Kylie Cosmetics. It just screams Autumn to me! All three shades have a matte finish as I don't know why but I always go for matte lips in Autumn time. I'm beyond excited to whip out these bad boys and start wearing them non stop. Another Autumn beauty favourite is Copper, Brown & Orange eyeshadows. My current favourite being the Kylie Cosmetics Creme Shadow in Copper. This is such a gorgeous product and it lasts all day. I love using this all over my lid and you only need one coat for a full pigmented look. For my crease I've been loving 'Texture' by Mac. It's a gorgeous brown with an orange undertone and I honestly cannot get enough of it. I also feel like I'm going to get so much use out of my Alice in Wonderland x Urban Decay palette just because it has gorgeous Orange and Purples for when I'm feeling a little edgy. Autumn is the month I get back into wearing jewellery. I honestly have no clue why this changes but in Summer I just don't wear it at all. Now I'm not a huge jewellery fan, I rarely wear necklaces or rings but I do love bangles. My go to bangles last year and I already can tell they will be this year too are the Alex and Ani Bangles. So far I've a collection of 9 assorting from quotes, to my birthstone, to symbols. I just adore these and love how mixing the colours of the mixed metals go with everything. I also start to wear my Fossil Rose Gold Watch again. This is something I kind of abandon and only wear in Summer when I remember it, but come Autumn I basically have it on me everyday. I really love wearing Skirts in Autumn time, layering up is probably my favourite thing. I recently picked up a tan coloured A-line skirt from Primark and I am obsessed with it. It even has pockets...POCKETS! It has a simple golden zip going down the middle and it's all just very pretty to look at. I cannot wait to wear it out! Finally Boots! Come Autumn time all my converse and shoes are kicked aside to bring in some boots. I currently am already starting to switch between my blue suede ones (pictured above) and a pair of plain black ones. I bloody love boots and definitely buy way too many pairs this time of year. I end up wearing them all to death that by the end of the season they're basically falling apart! Again I adore Primark for finding Boots because they're so affordable and when they do eventually fall apart I'm not even mad. 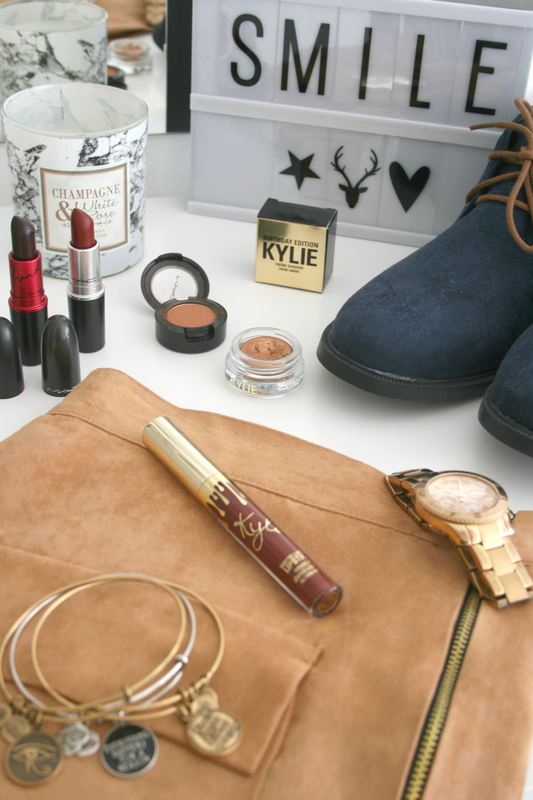 What are your Autumnal must haves? I'm very excited for Autumn - I really need to purchase some more berry lip shades! I am literally obsessed with skirts, and can't wait to start wearing them with tights and books. That watch is absolutely gorgeous! I so badly wish it was Autumn in New Zealand right now, it's currently Spring but still raining haha!